Azanis is a leading brand in scar removal product. New Azanis Scar Serum is three times more effective. Visit this website for more information. Fade your scars in 2 weeks without laser treatment. AZANIS SCAR SERUM is now formulated with Vita-Cocoa Booster Formula which is a special combination of 100% concentrated Natural Vitamin E (d-alpha tocopherol) and Organic Cocoa Butter (theobroma oil). D-alpha tocopherol has 50% more anti-oxidant power and is better absorbed than synthetic Vitamin E. While cocoa butter, the cream-colored fat extracted from cacao seeds, has long been reputed for its value in preventing and treating scars. Promote faster scar repair and smoother skin with high concentration of anti-oxidant and anti-inflammatory action in Natural Vitamin E (12,000 IU in 15ml pack) and Cocoa Butter. Visibly lightens the appearance of old and new scar by deeply hydrating and softening scar tissue while promoting collagen synthesis. When it is absorbed into the epidermis and dermis layers, cocoa butter forms a layer of moisture and oil that protects the skin from all external weathering elements that prevent the regrowth of damaged tissues. Gently massage a small amount of Azanis Scar Serum onto scar areas after cleansing. Apply morning and night or as often as required. For chickenpox marks and burns, wait until the marks have dried before using Azanis Scar Serum. For operation scars, wait until wound has closed and stiches removed before applying Azanis Scar Serum. As said, Azanis Scar Serum has 50% more potent antioxidants, active ingredients, and moisturizers at the same time. The compounds work synergistically in order to fast track the healing of your skin during the remodeling phase. The solution will push the scarred cells to the surface of the skin for sloughing away. Ultimately, Azanis Scar Serum will give you never expected production of normal cells, which will then take the place of your scarred cells. As a result, your skin will appear smoothed and flattened. Even the discoloration, swelling, flakiness, itching, and the redness of your scars will be targeted.It is made up of all-natural ingredients, which will provide you both vitamins and proteins. 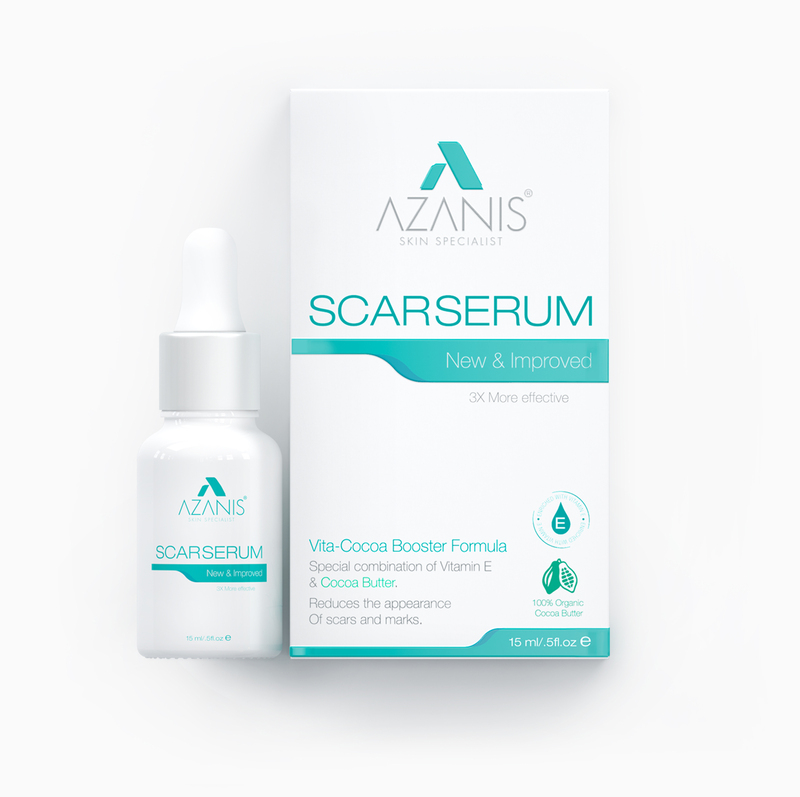 Now, optimized by our new formula, Vita-Cocoa Booster Formula, Azanis Scar Serum is at its best performance to solve your scar problem. Cocoa Butter boost up the effectiveness of our serum by providing the optimum condition for your skin remodeling phase. The formula will rejuvenate and repair the skin, giving it a new look like it never suffered from scars for years. Azanis Scar Serum promises to give you no reason to hide your skin anymore. Theobroma Oil, Paraffinum Liquidum, Triisononanoin, Cetearyl Ethylhexanoate, Isopropyl Myristate, Glycine Soja Oil, Helianthus Annuus Seed Oil, BHT & Bisabolol. Calendula Officinalis Flower Extract (Calendula Oil), Lavandula Angustifolia (Lavender Oil), Rosmarinus Officinalis Leaf Oil (Rosemary Oil) & Anthemis Nobilis Flower Oil (Chamomile Oil). Azanis Scar Serum are manufactured in a cosmeceutical production facility in compliance with the Good Manufacturing Practices (GMP).All ingredients used are tested and extremely safe to use under strict GMP conditions in an ultra clean state of the art facility, using some of the best equipment available. Quality inspections are conducted regularly throughout the manufacturing process and again at the completion of the process.There are no known side effects associated with Azanis Scar Serum. Scars are an inevitable part of life and can be form for many different reasons depending on the depth and type of the injury, location on the body, how a wound is treated but especially due to our unique individual physiology. Some scars will be unavoidable but Azanis Scar Serum is formulated to reduce the risk of developing a noticeable scar.Gently massage a small amount of Azanis Scar Serum onto scar areas after cleansing. Apply morning and night or as often as required. Note that Azanis Scar Serum should be applied only once the wound has healed, and should not be used on broken skin.Results will vary from individual to individual. Stretch marks, a skin condition commonly associated with pregnancy and weight gain, are far more common than you may think, and can affect men and women alike. When stretch marks occur, they generally include pregnant women and body builder, though they can also be the result of obesity and weight lifting. Stretch marks are tears in the middle layer of the skin, which occur after the skin has been stretched too far too quickly, and have the appearance of red or purple indented lines. After a while, the redness disappears, and white, depressed lines are left. Stretch marks can appear anywhere on the body that has been stretched, but they commonly form on the stomach, buttocks, breasts, upper arms and upper thighs. However, stretch marks are permanent. Azanis Scar Serum is formulated to reduce and improve the appearance , but it can never be remove. Gently massage a small amount of Azanis Scar Serum onto stretch marks. Apply morning and night or as often as required. During pregnancy, it should be applied from the start of the second trimester to areas that are prone to stretch marks such as the abdomen, breasts, lower back, hips, buttocks and thighs. Results will vary from individual to individual. Skin changes are among the most visible signs of aging. Evidence of increasing age includes wrinkles and sagging skin.What Azanis Scar Serum can do is to provide the nutrients to aid your skin restore its natural renewal cycle. Our ingredients used will provide your body with the required nutrients to restore your skin cell cycle to its original, youthful state by making it softer, smoother and more supple, thereby reducing the appearance of wrinkled skin. Azanis Scar Serum also moisturizes, which improves the texture, tone and appearance of fine lines and wrinkles.Gently massage a small amount of Azanis Scar Serum onto affected areas after cleansing. Apply morning and night or as often as required. Results will vary from individual to individual. Dehydrated skin effects many people of all ages. As we get older there is a significant drop in the Stratum Corneum Lipids – fats that are essential for the structure and function of living cells, as well as Ceramides (one of the important components that make up the skin’s Lipid Barrier). Azanis Scar Serum provide the skin’s natural oil layer, helping to restore its barrier function of retaining moisture. Gently massage a small amount of Azanis Scar Serum onto affected areas after cleansing. Apply morning and night or as often as required. 5 participants, 3 female and 2 male in age around 20 to 28. Scar formed about a year caused by minor injury. In 2 week, all participant's scar shows up to improve to 35% before the usage of Azanis Scar Serum. All participants happy with the result and continuing with the usage of Azanis Scar Serum. To test the efficiency of Azanis Scar Serum in improving and reducing appearance stretch marks. 7 participants, 4 female with after pregnancy stretch marks and 3 male with obesity stretch marks in age around 18 to 35. Stretch marks formed about 3 years back. In 4 week, all participant's stretch marks shows up to improve to 25% before the usage of Azanis Scar Serum. All participants happy with the result and continuing with the usage of Azanis Scar Serum.